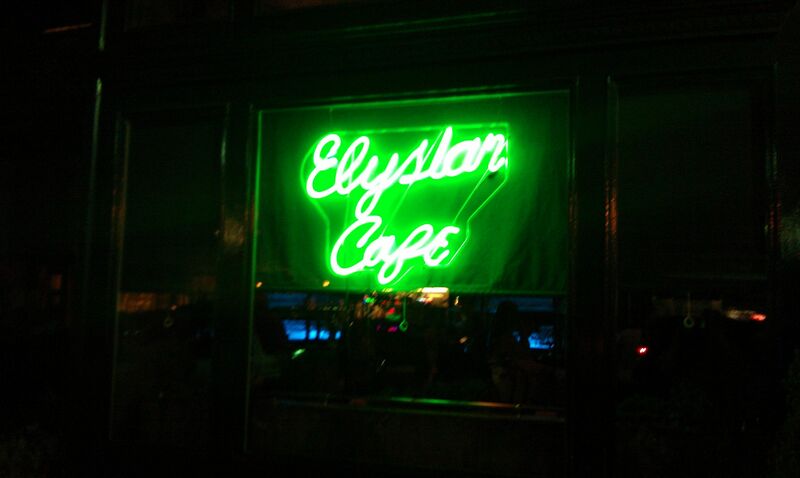 I had walked by Elysian Café countless times during my years in Hoboken, never going inside. Seeing people enjoying their brunch on their healthy green foliage outside, it always looked a little too upscale for me and my drinking. But finally I succumbed to the countless recommendations from my friends and decided to have a night of food and drink at one of Hoboken’s finest spots. Elysian Café is named after Elysian Fields, which is most famously known for being the site of the first baseball game ever. Elysian Fields (now Elysian Park) still exists although in a much smaller extent a block behind Elysian Café and its legacy lives on in America’s Pastime. Elysian Café is located on the northeast corner of the intersection of Washington Street and 10th Street. Their expansive outdoor patio dominates the corner, and you will always see a crowd eating outside during the more pleasant months. This evening though we had reservations inside, with some food and drinks lined up. We walked through the bar area and my jaw dropped at the high ceilings and gorgeous detail work on the floors and the ceiling of the bar area. Apparently, according to their website, Elysian Café is the longest continually operated bar in Hoboken (it existed through the prohibition era as a hair salon and an ice cream parlor). But more impressive is the restoration project this bar had to go through. Prior to the transformation, this location was a dingy factory bar but the restoration project uncovered and brought to life the inner beauty of this historic old space. Besides having such a wonderful interior, Elysian Café also offers a great drink selection. I had a couple of seasonal beers while at dinner, picking from their draught menu. The other members of my party had some prosecco and some of Elysian’s delicious drinks from their cocktail menu. After dinner we went into the bar area. As I admired the entire space from the amazing ceiling work, the back room was converted from a dining room into a place for a band to play. On this night the band sounded like a jazz version of David Bowie during his Ziggy Stardust years. They changed the lighting to a purplish tint and the place felt like a classy jazz bar. After a few more drinks, it was time to stumble home, but much like all the others that came before me I really enjoyed by time at Elysian Café. Preconceived notion – As I mentioned earlier I’d never been there, but it came highly recommended. Mainly for its food, and not necessarily for the bar, but I came in expecting big things. Bar Type – It’s a French bistro restaurant, with the feel of a jazz bar on the night we went. Crowd stereotype – Mainly couples, and primarily 30ish and up. Music – They had a band playing jazz/light rock numbers. Value – Had a nice selection of beers plus an innovative drink menu. 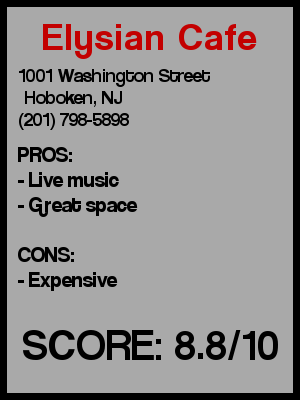 Date – One of the top places to bring a date in Hoboken. If the girl is out of your league and you need to make a good impression then take her here. If you are thinking long term…hold off and save this for an important occasion. Don’t want to start them off on something this nice and raise expectations. First or last drink of the night – It was good for our first and last drinks of the night. food and drink at one of Hoboken’s finest spots.